A mixed-use building in an area transitioning from residential to commercial properties was renovated into an office building for BARNES Buildings and Management Group Inc. in Weymouth, Mass. BARNES served as general contractor and installer for its project. To convert the building, BARNES demolished some existing wood structure in the rear. In its place, the company fabricated and erected a two-story, steel-framed addition. BARNES gutted and re-framed the remainder of the existing wood structure. Two types of wall panels and a metal roof were used for the 4,000 square-foot project. BARNES horizontally installed about 3,000 square feet of MBCI’s 24-gauge PBD metal wall panels in Silver Metallic. The horizontal panels have custom trim details. It vertically installed 1,000 square feet of MBCI’s 24-gauge, 12-inch-wide, Designer Series flat metal wall panels in Slate Gray. For the roof, BARNES installed 2,500 square feet of MBCI’s 24-gauge LokSeam standing seam roof system in Brite Red. 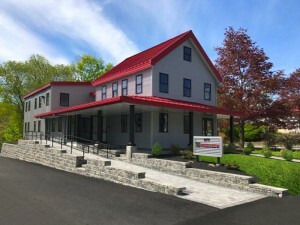 MBCI fabricated custom trim, flashings, gable, eaves, gutters and downspouts for the project. For snow retention, S-5!’s ColorGard system was added. The project was completed in June 2016.